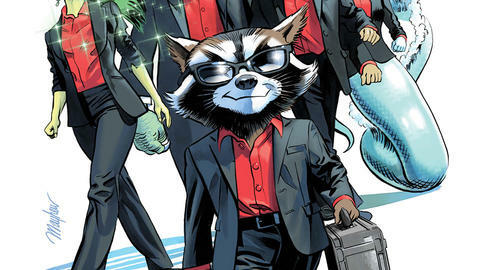 Al Ewing and Adam Gorham launch Rocket Raccoon into a bold new series! Rocket Raccoon—destined for a life of crime? 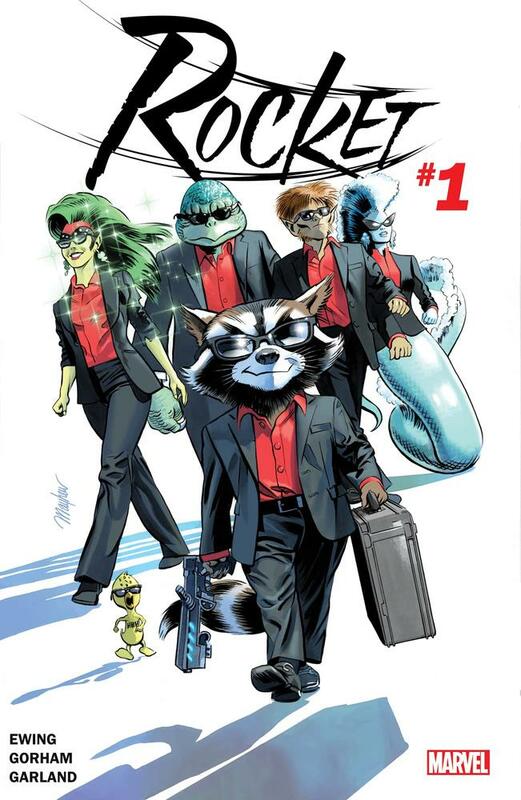 In the upcoming ROCKET ongoing series, debuting in May, we’ll see our furry hero getting sucked back into his life of cons and heists—but for a noble purpose. We caught up with writer Al Ewing and artist Adam Gorham about what we can expect from this chapter in the story of everyone’s favorite raccoon-looking, space-traveling protagonist. Marvel.com: I see Rocket as kind of a contradiction, not just because he looks adorable but has kind of a gruff personality, but also because he has this big heart that he may not always show. Can you talk a little about your experience working on such a unique character? Al Ewing: Rocket has such a long and varied history. He has gone from a sheriff type, a lawman-slash-warden overseeing an asylum with a bunch of other humanoid animals, and over the years he has become much more of an outlaw. We’ve padded out his backstory slightly by giving him some “wild years” post-Halfworld—and we’ll explain it all in issue #1. So we’ve had an interesting time showing flashes of these shadowy pasts he doesn’t like to talk about much. We definitely see some of that heart, though. Adam Gorham: After reading Al’s script, it seemed clear that we’d see a more vulnerable side to Rocket than I can recall. So I considered it important to have the character emote, visually imparting pathos along with Rocket’s signature smarmy charm. I’ve had fun, and the more I draw him the more I discover who Rocket is to me, personally. Marvel.com: Can you tell me a little about your experience working together? Adam Gorham: I must say, I’ve only met Al the once at a convention in New York City. We had shared a correspondence with our creative team before that, but in person I was happy to discover he’s a very thoughtful speaker and very open to including me in the direction of the overall story. I greatly look forward to gelling with him as we carry on. Marvel.com: Adam, I imagine the process of creating a character who looks like a raccoon differs from that of depicting a human character. What additional challenges go along with this, if any? How do you make him adorable but not overly cartoony? Adam Gorham: So far, I’ve learned from drawing Rocket that you have to embrace the cartoony nature of an anthropomorphic animal. When I tried to keep his emotions and body language too human or “real,” he came off reserved and stiff. Readers have come to know Rocket as an expressive, loud, character—perhaps a bit unwieldy. So I don’t try to escape that, but I do try to have him act cooler, like Daniel Ocean with a penchant for blasting first. Throw my gritty inks on top of that and you have our Rocket! Marvel.com: It sounds like Rocket will have some internal dilemmas in this book. We’ll see him feeling somewhat reluctant about going back into the heist business. How much does that conflict play into his story? Al Ewing: He goes back in for heroic reasons—the best reasons, really—in order to help an old friend-slash-something-more. But I wouldn’t consider it too much of a spoiler to say that the situation goes south very quickly, and takes Rocket with it. Once back in that life, Rocket finds himself very much back in it, and as things get crazier, so do the heists. I’d call it very much a “caper” book. Marvel.com: Would you like to tease or mention anything else? Al Ewing: I’ll drop one word: “Technet.” See you all in ROCKET #1! Get down and dirty with Al Ewing and Adam Gorham on ROCKET, coming this May!